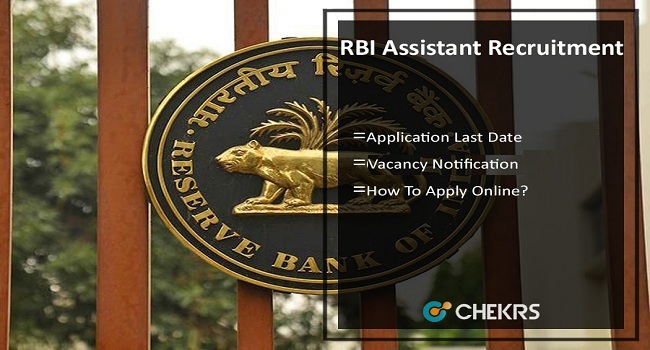 RBI Assistant Recruitment 2019: The Reserve Bank of India invites applications from eligible candidates for posts of “Assistant” in various offices of the Bank through the RBI Assistant Recruitment 2019 Online Application. The application process will be started very soon in the online mode. Selection for the post will be through a country-wide competitive examination in two phases i.e. preliminary and the Main examination followed by a Language Proficiency Test (LPT). The Pre & Main Exam Dates have been announced through the RBI Assistant 2019 Notification Pdf. The Reserve Bank of India invites applications from eligible candidates for posts of “Assistant” in various offices of the Bank through the RBI Assistant Vacancy. (आरबीआई सहायक भर्ती): The Reserve Bank of India will be released the Government Recruitment Notification to fill up the Assistant Posts Vacant seats. The candidates can check the Category & City Wise vacancy details. Here we have shared the Reserve Bank of Indian Assistant Notification 2019 which has been contained the complete details such as Eligibility, Age Limit, Selection Process, Exam Date, how to Apply Online, Application Fee, Examination Centers etc. the RBI will conduct the Online Preliminary and Main Exam will be organized in the upcoming months. You can get the RBI Assistant Examination 2019 information from here. Candidates can apply online for the application form and no other mode of application will be accepted. After complete the RBI Assistant 2019 Online Application Process candidates should have to pay the application fee in the online mode. The payment can be made by using Debit Cards (RuPay/Visa/MasterCard/Maestro), Credit Cards, Internet Banking, IMPS, Cash Cards/ Mobile Wallets. Candidates can also check the more details of Bank Jobs from here. Before applying, Candidates should ensure that they fulfill the eligibility criteria for the post. Candidates can apply online through the Bank’s website. A candidate belonging to Ex-servicemen category (except dependents of ex-servicemen) should either be a graduate from a recognized University or should have passed the matriculation or its equivalent examination of the Armed Forces etc. The Upper age relaxation for the Reserved Category Candidates will be based on the RBI Norms. Assistants will draw a starting basic pay of ₹ 14650/- per month (i.e. ₹ 13150 plus two advance increments admissible to graduates) in the scale of 13150-750 (3)-15400- 900(4) -19000-1200(6)-26200-1300 (2)-28800- 1480(3) – 33240 – 1750 (1)- 34990 (20 years) and other allowances. Visit the Official Website of RBI. Click on the Opportunities@RBI Button. Click on the Current Vacancies Link. Search the Recruitment for the Post of Assistant link and click on it. Read the whole Notification details hit on the again Recruitment for the Post of Assistant Link. To register application, choose the tab “Click here for New Registration” and enter Name, Contact details, and Email id. A Provisional Registration Number and Password will be generated by the system and displayed on the screen. Fill the application form with correct information and click on SAVE AND NEXT Button. Upload the Scanned photograph, signature & documents. Candidates can take a print out of application form for the further uses. You can get the complete information of RBI Assistant Recruitment 2019 and we are providing the latest update related to upcoming Recruitment on our website that is www.jobs.chekrs.com. If you have any query about the Reserve Bank of India Recruitment that you can write comments on the commenting box and take a review or feedback.